20120325 - UP and L and the boys to church while I finished up some work in the office. Then I met the fam and Gma&paB with the Coles for lunch. Back home all packed up and ready to go and we headed to the Farm. We got there and did some work on the fire pit and looked things over again for the upcoming MSD@tF. Dinner and boys to bed. Dad and I stayed up and talked a bit. 20120324 - Up and out with the boys, L to Zumba. 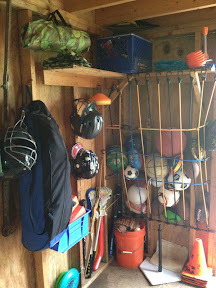 We headed to the shed an spent the entire day cleaning it out and organizing it. The boys played hard outside all day. L had a pic from a blog of a ball container and I replicated it with bungee cords. Ordered pizza for dinner and hung out.